You may already know that eating certain foods can make your blood glucose levels rise faster than eating other foods. Did you know that the order you eat a meal can also influence how your body metabolizes the food? Scientists from Cornell University recently reported on how the order a meal is eaten can directly effect blood sugar levels following the meal.1 Specifically, the study showed that consuming the carbohydrate portion of a meal last significantly reduced blood glucose levels after the meal. Let’s start with the basics of the study. Participants were fed identical meals, in three different orders, on three separate occasions: carbohydrate first, protein and vegetable first, and combined as a sandwich. 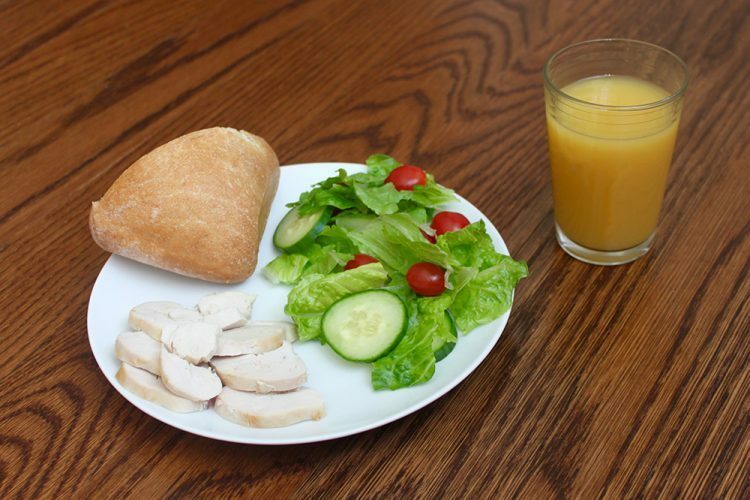 All meals contained: ciabatta bread, butter, grilled chicken breast, lettuce, tomatoes, cucumber, salad dressing, and a glass of orange juice. Each meal was consumed in 30 minutes, with the first half of the meal followed by a 10 minute rest period, followed by the second half of the meal. The above graph shows that both the sandwich and carb first meal quickly raised the blood glucose level of participants. By contrast, the carb last meal did not result in an initial blood glucose spike. 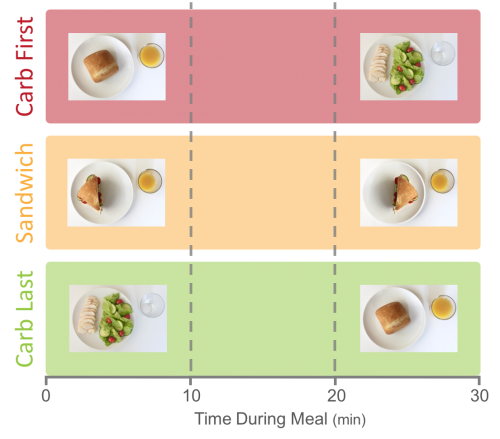 These results demonstrate that the timing of consuming different meal components (carb, protein, vegetables) can have a significant impact on resulting blood glucose levels. In fact, the researchers found that the reduction in blood glucose increase was comparable to that of many hypoglycemic drugs. This is important because if you have type 2 diabetes, high blood glucose is a risk factor for many complications. You can eat the exact same foods, in three different orders, and your body will likely respond differently each time. Consuming the carbohydrate portion of a meal last can significantly reduce the glycemic load of a meal. 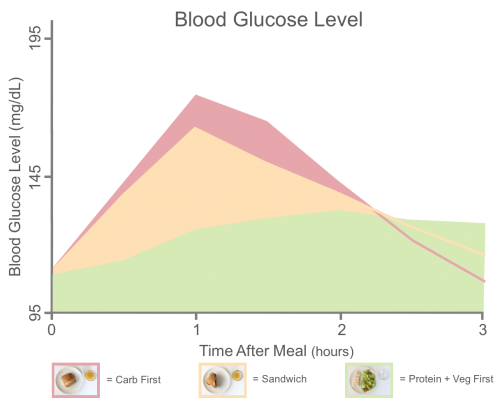 This change in meal ordering can be a practical strategy for managing blood glucose spikes, especially when dining out where you may have less control of the meal options. Finally, if you want to be fuller longer, do not begin your meal with bread or another carbohydrate. Though this study didn’t evaluate hunger and subsequent caloric consumption, we have seen previously that foods that are high on the glycemic index will cause you to be hungrier sooner and eat more later.4 So it stands to reason that eating a meal that does not cause a quick blood sugar spike may help you stay fuller longer. Whether you are actively trying to manage your blood glucose levels because of a chronic illness or simply because you want to feel satiated longer, modifying how you eat may help. For example, during a traditional Thanksgiving meal, start with turkey, gravy and some of the veggie side dishes. Save your favorite carb-heavy dish (mashed potatoes or stuffing) for the end of the meal. The study was a small clinical study that evaluated the short term effect of different meal eating patterns on blood glucose, insulin, and glucagon-like peptide-1 levels of 16 men and women with type 2 diabetes. Therefore, results may only be applicable to people with type 2 diabetes. However, the CDC currently estimates that almost 10% of the American population has type 2 diabetes and 33% are pre-diabetic.5 So even if these results only apply to people who are insulin resistant, they still may help a large percentage of the population. Carb First Meal: Ciabatta bread and orange juice over a 10 minute period, a 10 minute rest interval, followed by a chicken breast and salad (lettuce, tomatoes, cucumber + dressing) eaten over 10 minutes. Sandwich: All meal components together as a sandwich. Half of sandwich plus half of juice consumed over a 10 minute period, a 10 minute rest interval, followed by remaining half sandwich and orange juice eaten over final 10 minutes. Carb Last Meal: Chicken breast and salad (lettuce, tomatoes, cucumber + dressing) eaten over a 10 minute period, a 10 minute rest interval, followed by ciabatta bread and orange juice eaten over 10 minutes.